This price at 15A! And even if used for a long time It will last long. I want to buy it again. This review is about item#39471232. Since the wire capacity is 15 A, it is convenient to use for large equipment. Since it is not a winding type, you do not have to worry about heat generation from the wire. This review is about item#39471205. I used it in an electric grass mower, it was light and soft and could be used normally. To extend the power of the electric tool outdoors. I have a 10M or 30M (reel type) thing, but it is almost too long when I use it. But this product is just right on the length, the wire is 2.0 mm 2 × 2 core so it is affordable and secure. This review is about item#39471223. Although I bought it because it was not sold by others elsewhere I found it a bit thicker and cheaper code on my home center and I am disappointed. There was considerable 15 A. It is enough if it can be used up to 15 amperes and 10 m of code is this price. Code material is not too hard, easy to use. Even though I thought of the price, it was very affordable. When using electric tools etc. I am happy that the price is cheap. I think that it is perfect for performance. Even if we extend it considerably, the electric equipment moves normally. I am using it as an extension cord of a semiautomatic welding machine but it is in good condition. It was made in Japan with reliable truss. In today's world, I think that it is impossible to be made in Japan from parts to manufacture, but I think that it is better than the complete made in China. 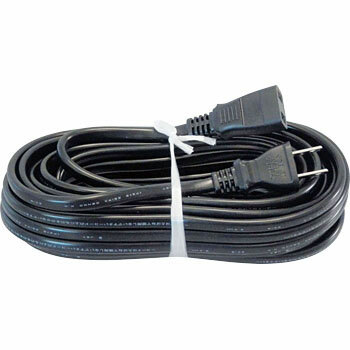 Since our compressor needs 15 A, 2.0 mm 2 × 2 extension cord was necessary because normal current 1.25 mm 2 × 2 has only 12 A permissible current and does not correspond to 15 A at the maximum operating time of the compressor. In the home center etc. only 1.25 mm 2 × 2 are sold and it is very useful.